In addition to getting a week’s worth of green veggies in one sitting, you can also add two ingredients to your healthy smoothie to take it to the next level. I add a tablespoon or so of ground cinnamon to my smoothies. It tastes great and has a number of reported health benefits. But even if it did nothing for my health, it just makes the smoothie taste better. Research has sown that it can reduce bad cholesterol as well as regulating blood sugar. It has proven to inhibit the growth of yeast infections and some kinds of common bacteria. One study showed that even just smelling cinnamon improves your cognitive function and memory. Best of all, cinnamon has very few calories, only about 17 per tablespoon. 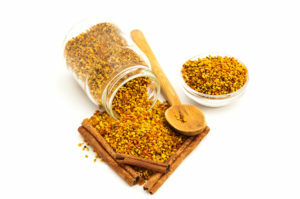 Another great thing to add is bee pollen. Long touted as a way to help with plant allergies by improving your resistance to local pollen, it also has some interested other health benefits. Almost everyone who takes it has an increase in energy and endurance. And most also report improved sexual function as well. Add to that reports of weight loss, cancer fighting abilities, and anti-aging properties and it seems like a cheap thing to take a chance with. Be sure to start out with a small dose to see if you have a reaction. Then add a little every day.